Frontier A320 LOSES PART OF THE ENGINE COWLING departing Las Vegas! Flights have resumed in/out of Ted Stevens Anchorage International Airport, following a 7.0 earthquake. Please monitor your flight status regularly. Sign up for flight notifications and we'll notify you of any last-minute delays, cancellations, or gate changes on your flights by email or text message. Updates will be posted to blog.alaskaair.com. 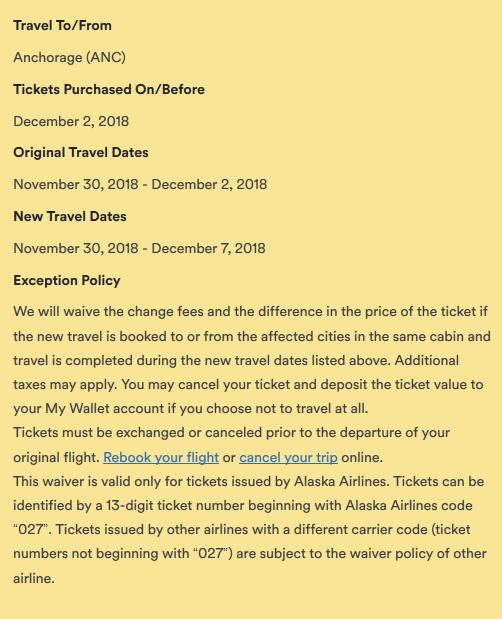 If you're traveling to or from the affected city during the dates listed below, we are offering a waiver if you would like to change or cancel your flight. If you purchased your tickets through a third party, such as Expedia, another travel agency, or another airline, contact them directly for assistance. Minors traveling unaccompanied will be accepted on flights to the affected cities during this period. Minors traveling unaccompanied will be accepted on flights from the affected cities during this period. Pets traveling in the hold or shipped via Alaska - Air Cargo will be accepted on flights to the affected cities during this period. Pets traveling in the hold or shipped via Alaska - Air Cargo will be accepted on flights from the affected cities during this period. Passenger traveling with their pets in the cabin will be accepted on flights to the above cities. Passenger traveling with their pets in the cabin will be accepted on flights from the above cities. Hotel/Food/Ground Transportation amenities will not be provided by Alaska Airlines. As major construction continues at the airport there may be delays during peak travel hours, and food and shopping options might be limited in some areas. Flights may operate out of remote gates, meaning some guests will travel on a shuttle bus to and from Concourse D Annex departure gates and their aircraft. Be sure to arrive at least 2 hours before your flight departs, and follow airport signage for guidance during construction. Learn more about the Seattle airport expansion "This indicates a link to an external site that may not meet accessibility guidelines." and how Concourse D Annex travel will work. "This indicates a link to an external site that may not meet accessibility guidelines." The both wheels of the nose gear separated from the aircraft after a hard landing. 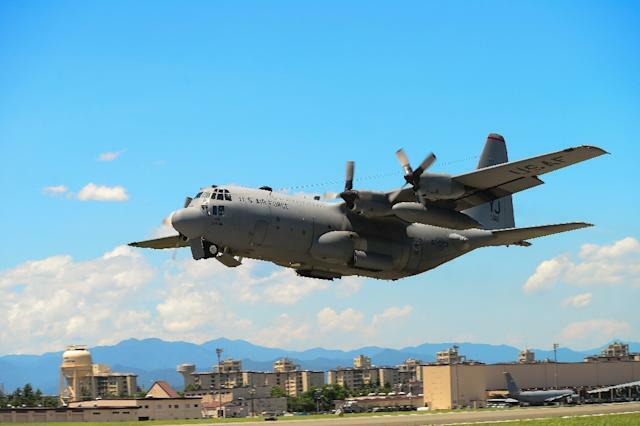 TOKYO — A Marine refueling plane and a fighter jet crashed into the Pacific Ocean off Japan's southwestern coast after colliding early Thursday, and rescuers found two of the seven crew members, one of them in stable condition, officials said. The website of defense contractor BAE Systems says the Hawker Hunter is a British jet developed in the late 1940s and early 1950s. HONOLULU: A civilian contractor for the Hawaii Air National Guard who was participating in a military exercise survived after his plane crashed off the coast of Honolulu, authorities said Wednesday. US Coast Guard spokeswoman Petty Officer Sara Muir says the pilot is in stable condition after being rescued about 3 miles (4.8 kilometers) south of Oahu near Honolulu’s Sand Island. The pilot had been participating in a military exercise called Sentry Aloha exercise, said US Coast Guard Petty Officer Matthew West. The Hawaii Air National Guard was hosting the exercise, which involved about 800 personnel and 30 aircraft from nine states. A light aircraft crashed in the United States and fell on a football pitch in . Four people were killed on board, reports the Atlanta Journal-Constitution. An Ethiopian Airlines flight ET302 to Nairobi crashed on Sunday carrying 149 passengers and eight crew members, the airline said in a statement on its website. "It is believed that there were 149 passengers and 8 crew onboard the flight but we are currently confirming the details of the passenger manifest for the flight," the statement said. The Boeing 737 crashed around Bishoftu (Debre Zeit) in central Ethiopia. The plane took off at 08:38am from Ethiopia’s Addis Ababa, Bole International Airport and lost contact six minutes later, the airline said. There is no information about the fate of those who were onboard the plane, a search and rescue operation is underway. The Ethiopian Airlines’ personnel will join the effort. An Ethiopian Airlines flight crashed shortly after takeoff from Ethiopia's capital on Sunday morning, killing all 157 people thought to be on board, the airline and state broadcaster said. The state-owned Ethiopian Airlines, widely considered the best-managed airline in Africa, calls itself Africa's largest carrier and has ambitions of becoming the gateway to the continent. Its statement said 149 passengers and eight crew members were thought to be on the plane that crashed six minutes after departing Addis Ababa on its way to Kenya's capital, Nairobi. 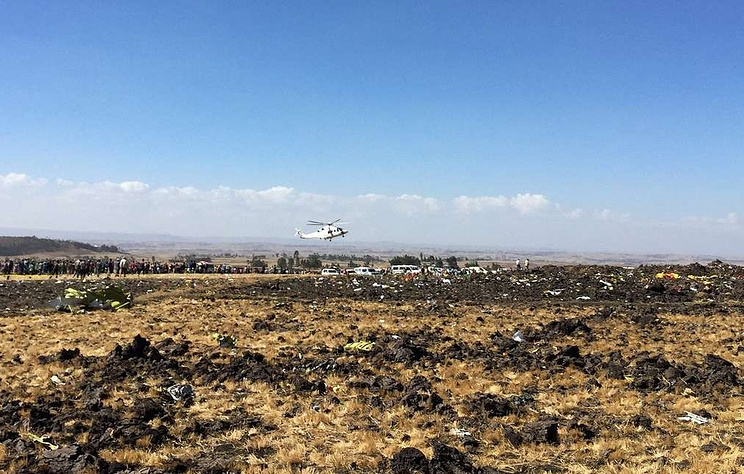 The crash occurred around Bishoftu, or Debre Zeit, some 50 kilometers (31 miles) south of Addis Ababa, at 8:44 a.m. The plane showed unstable vertical speed after takeoff, air traffic monitor Flightradar 24 said in a Twitter post. Visibility appeared to be clear. State broadcaster EBC reported all passengers were dead and that the passengers included 33 nationalities. An Ethiopian Airlines spokesman said 32 Kenyans and 17 Ethiopians were among the victims. Greiving family members gathered at Bole Airport. A statement by the Ethiopian prime minister's office offered its "deepest condolences" to families. Kenya's transport minister, James Macharia, told reporters that authorities had not yet received the passenger manifest. He said an emergency response had been set up for family and friends. "My prayers go to all the families and associates of those on board," Kenya's President Uhuru Kenyatta said, as many Kenyans braced for the worst. Records show that the plane was new. The Planespotters civil aviation database shows that the Boeing 737-8 MAX was delivered to Ethiopian Airlines in mid-November. In October, another Boeing 737-8 MAX plunged into the Java Sea just minutes after taking off from Jakarta, Indonesia's capital, killing all 189 people on board the plane Lion Air flight. The cockpit data recorder showed that the jet's airspeed indicator had malfunctioned on its last four flights, though Lion Air initially claimed that problems with the aircraft had been fixed. The last deadly crash of an Ethiopian Airlines passenger plane was in 2010, when the plane crashed minutes after takeoff from Beirut killing all 90 people on board. Speaking at the inauguration, the prime minister challenged the airline to build a new "Airport City" terminal in Bishoftu — where Sunday's crash occurred. An Ethiopian Airlines plane that crashed on Sunday was carrying passengers from more than 30 countries, the airline's CEO told journalists. Eight Chinese passengers were aboard an Ethiopian Airlines Boeing 737 commercial jet to Nairobi that crashed on Sunday carrying 149 passengers and eight crew members, Chinese state TV said. An Ethiopian Airlines Boeing 737 passenger jet to Nairobi that crashed early on Sunday with 149 passengers and eight crew members aboard "had unstable vertical speed", Swedish flight-tracking website flightradar24 said. The U.S. National Transportation Safety Board will send four people to assist in the fatal Ethiopian Airlines crash, an NTSB spokesman said on Sunday. Fourteen people were killed in a plane crash in the Colombian plains province of Meta on Saturday, the country's civil aviation agency said. The Special Administrative Unit of Civil Aeronautics said there were no survivors of the crash, which occurred after the DC-3 aircraft made a distress call at 10:40 a.m. local time (1540 GMT). The plane, which is owned by Laser Aereo airlines, was en route from the southern city of San Jose del Guaviare to central Villavicencio, the agency said. It crashed about midway through its flight, in San Carlos de Guaroa municipality. The airline said it had no immediate comment. In a later statement posted on Twitter, the agency named those who had died, including the mayor of a small town in the jungle province of Vaupes. The aircraft’s navigability permissions were up-to-date, as were the medical certifications of its crew, the agency added. The diplomats maintain contact with the victims’ relatives and are ready to support them in this situation. Three Russians that were killed in the Ethiopia plane crash on Sunday morning have been identified, the Russian Embassy in Addis Ababa stated on Twitter. Ekaterina Polyakova, Alexander Polyakov and Sergei Vyalikov" the embassy informs. "We express our deepest condolences to the families of those killed." The diplomats maintain contact with the victims’ relatives and are ready to support them in this situation, the embassy added. The Boeing 737 en route from Ethiopia’s capital of Addis Ababa to Kenya’s Nairobi crashed on Sunday morning near Debre Zeit in central Ethiopia. The plane lost contact six minutes after takeoff, the airline said. There were 149 passengers and 8 crew members onboard the plane. There are no survivors in the crash. The DC-3 that crashed in Colombia (HK-2494 of Laser Aéreo) was originally delivered to the USAAF in 1944. It had changed hands several times during its 75 years in service. Five years ago another DC-3 had crashed in Colombia. It was HK-4700 of ALIANSA Colombia. Just an odd question - the tree's in the photo look beautiful and healthy - what species are they? The rows and spacing are perfect. Is there any back story on that Amazon Air Cargo flight that crashed in Texas yet? China's aviation regulator said on Monday it had ordered Chinese airlines to suspend their Boeing Co 737 MAX aircraft operations by 6 p.m. (5.00 a.m. ET) following a deadly crash of a 737 MAX 8 operated by Ethiopian Airlines. Boeing Co said late Sunday it will postpone the planned ceremonial debut of its 777X widebody aircraft after Sunday's crash of an Ethiopian Airlines plane that left 157 dead. Hi Yupo, I'll see what I can dig up? A Boeing 767 cargo plane crashed Saturday outside of Houston just minutes before its scheduled arrival. The three people aboard the Amazon Prime Air cargo plane that crashed outside Houston have been confirmed dead, the plane's operator said Sunday. The Boeing 767 operated by Atlas Air was a scheduled cargo flight for Amazon from Miami to Houston on Saturday when it nosedived into a swampy area about 30 miles from George Bush Intercontinental Airport. Witnesses said they heard the plane’s engines surging and watched the craft turn sharply before falling into a nosedive. AccuWeather meteorologists suggested weather could be to blame: "There were a few showers with gusty winds in the vicinity of Houston at the time of the crash. While an investigation needs to take place, these were around the area and could have been a factor in the crash," AccuWeather Senior Meteorologist Alan Reppert said. Atlas Air First Officer Conrad Aska, 44, and Sean Archuleta 36, were killed when Atlas Air flight 3591 crashed into the shallow waters of Trinity Bay on Saturday, Feb. 23, 2019, near Anahuac. The body of Capt. Ricky Blakely, of Indiana, has yet to be recovered as of Monday night, officials said. In a video posted by the Chambers County Sheriff's Office, hundreds – if not thousands – of disintegrated plane parts are seen sitting in shallow, murky water. The debris field spans about 180,000 square feet, officials said. The largest piece authorities have recovered is 50 feet long, they said. Most of the debris in the video is indiscernible. As of late Sunday night, investigators have yet to recover the plane's black box, which records flight data and the voices of those in the cockpit. Authorities have also yet to recover the body of the third crew member. The first two bodies have been sent to the Jefferson County Medical Examiners Office for autopsies. Winds have pushed the bay's tide out, which exposed more of the debris, according to the Chambers County Sheriff's Office. A five-second clip of the plane nosediving into the water was captured on a security camera at the Chambers County jail, near the intersection of Court Street and Bolivar Avenue in Anahuac. Investigators hope use that video to learn more about what downed the plane. This Ethiopian Airlines crash has generated a lot of news coverage within 24 hours. The United States told international carriers on Monday that the Boeing 737 MAX 8 is airworthy as regulators scrutinize two fatal crashes of the new model of aircraft since October, but said it will mandate forthcoming "design changes" from Boeing by April. The United States told airlines it was safe to fly 737 MAX 8 planes on Monday as investigators found two black box recorders that will help piece together the final moments of an Ethiopian Airlines jet before it plunged to the ground on Sunday. Democratic U.S. Senator Dianne Feinstein on Monday urged the U.S. Federal Aviation Administration to ground Boeing's 737 MAX 8 fleet after two fatal crashes since October. The Ethiopian Airlines plane that crashed killing 157 people was making a strange rattling noise and trailed smoke and debris as it swerved above a field of panicked cows before hitting earth, according to witnesses. A prize-winning author, a football official and a team of humanitarian workers were among those who perished in the crash of Ethiopian Airlines Flight 30, government officials and employers said on Monday. Boeing Co's insurers face big claims from families of the victims of the Ethiopian Airlines crash, coming less than six months after the crash of the same type of Boeing aircraft in Indonesia, insurance and aviation sources said. The United Nations has suffered one of its biggest losses in years in the deadly crash of an Ethiopian Airlines passenger jet bound for Nairobi, the head of the U.N. in Geneva said on Monday, without giving a new casualty figure. Boeing Co's top executive told employees on Monday he was confident in the safety of the U.S. manufacturer's fastest-selling 737 MAX aircraft in the wake of two deadly crashes since October. Boeing Co confirmed late on Monday it will deploy a software upgrade to the 737 MAX 8, a few hours after the Federal Aviation Administration said it would mandate "design changes" in the aircraft by April. Ryanair is not planning to make any changes to the delivery of its first Boeing 737 MAX airplane next month in light of the crash of an Ethiopian Airlines jet, chief executive Michael O'Leary was quoted as saying on Monday. The black box recovered from the Ethiopian Airlines plane that crashed on Sunday is the cockpit voice recorder, Ethiopian state TV said on Monday. Southwest Airlines Co said on Monday several customers sought to know if they would be flying in Boeing Co's 737 MAX 8 aircraft, in the wake of the second deadly crash involving the jet in less than six months. Airlines from North America to the Middle East kept flying the 737 MAX 8 on Monday after Boeing said it was safe, in stark contrast with a slide in the planemaker's shares on worries over Sunday's Ethiopian Airlines crash that killed all 157 on board. Canadian Transport Minister Marc Garneau said on Monday he will not hesitate to take action once the cause of the Ethiopian plane crash involving Boeing Co's 737 MAX 8 aircraft is known. Malaysia may have to reconsider the purchase of 25 Boeing Co 737 MAX 8 aircraft, the Nikkei reported on Monday, citing the country's economic affairs minister, after the second fatal crash of the planemaker's newest jet in less than six months. Indonesia will temporarily ground Boeing 737 MAX 8 aircraft operating in the country for inspection, the director general of aviation said on Monday, in the wake of the deadly crash of one of the planes in Ethiopia. Morocco's national carrier Royal Air Maroc has temporarily grounded a Boeing 737 MAX 8 following the fatal crash of the same type of aircraft in Ethiopia, an official said on Monday. China and Indonesia have grounded Boeing 737 MAX 8 aircraft operated by their airlines in reaction to the fatal crash of a plane of the same type operated by Ethiopian Airlines on Sunday. Mexican airline Aeromexico said on Monday it had suspended the operation of its six Boeing 737 MAX 8 planes until it had clear information about the investigation into the crash of an Ethiopian Airlines jet on Sunday. India's Directorate General of Civil Aviation (DGCA) said on Monday it is reviewing safety issues related to Boeing's 737 MAX 8 aircraft operating in the country, a day after the fatal crash of one of the planes in Ethiopia. China's aviation regulator on Monday grounded nearly 100 Boeing Co 737 MAX 8 aircraft operated by its airlines, more than a quarter of the global fleet of the jets, after a deadly crash of one of the planes in Ethiopia. Norwegian Air's shares fell sharply on Monday as investors worried over weaker-than-expected passenger income and the potential impact of the crash of an Ethiopian Air Boeing 737 MAX 8 passenger jet the previous day. A spokesman for the German Transport Ministry said on Monday that there were no Boeing Co 737 MAX 8 in service in Germany, after China and Ethiopia grounded such planes following an Ethiopian Airlines crash that killed 157 people. Shares in French aerospace group Safran fell on Monday, which traders attributed to fallout from Sunday's crash of an Ethiopian Airlines 737 MAX 8 plane. Flydubai remains confident in the airworthiness of its Boeing 737 planes, an airline spokeswoman said on Monday, a day after an Ethiopian Airlines 737 MAX 8 crashed. 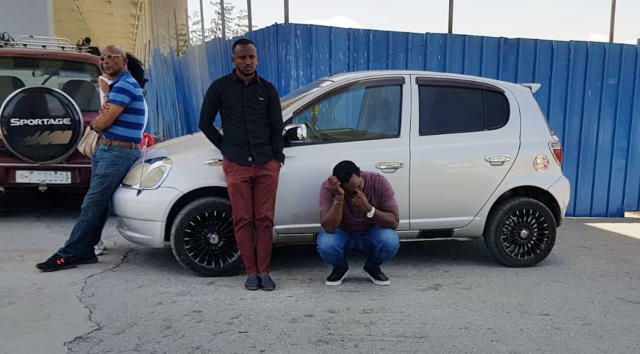 A prize-winning author, a soccer official and a team of humanitarian workers were among those who perished in the crash of Ethiopian Airlines Flight ET 302, government officials and employers said on Monday. The number of U.N. staff members and aid workers from other agencies on board may have been higher than usual because of a week-long conference convened by the U.N. Environment Program (UNEP) in Nairobi, which opened on Monday. Major European nations Britain, Germany and France joined a wave of suspensions of Boeing 737 MAX aircraft on Tuesday as U.S. President Donald Trump fretted over modern airplane design following a crash in Ethiopia that killed 157 people. German Transport Minister Andreas Scheuer told German broadcaster n-tv on Tuesday that German airspace was closed for Boeing 737 MAX aircraft. Norwegian Air will temporarily ground its Boeing 737 MAX 8 passenger jets at the advice of European regulators, it said on Tuesday. The Irish Aviation Authority is temporarily suspending the operation of all variants of the Boeing 737 MAX aircraft in Irish airspace with immediate effect following a deadly crash in Ethiopia, it said on Tuesday. Turkish Airlines has grounded all commercial flights by its Boeing 737 MAX models as of March 13 until uncertainty over their safety is resolved, CEO Bilal Eksi said on Tuesday. Russian S7 Airlines said on Monday it would ground Boeing 737 Max 8 airlines starting from Wednesday following the crash of an Ethiopian Airlines plane. Democratic U.S. Senator Richard Blumenthal on Tuesday asked American Airlines, Southwest Airlines and United Airlines to voluntarily ground all Boeing 737 MAX 8 and MAX 9 planes after two deadly crashes in recent months. Germany's air safety authority DFS said on Tuesday that both Boeing 737 MAX 8 and MAX 9 models will be barred from the country's air space until June 12. 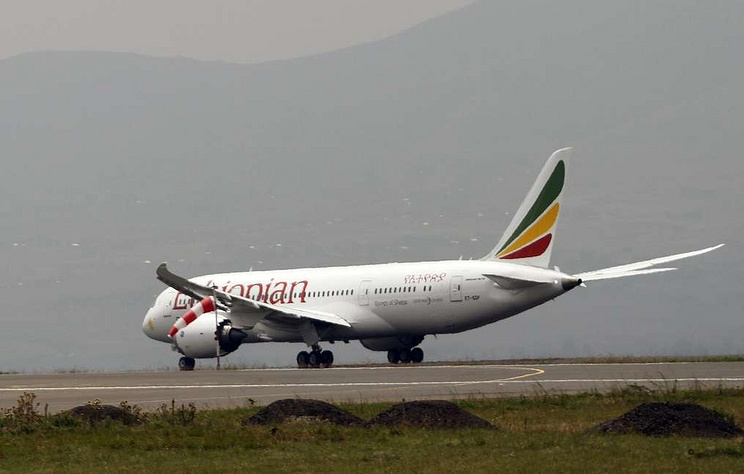 Belgium closed down its air space for Boeing 737 MAX planes, the country's news agency Belga quoted transport minister Francois Bellot as saying on Tuesday after the Sunday's deadly plane crash in Ethiopia. Argentina and other South American nations are evaluating closing their airspace to Boeing 737 MAX airplanes following two fatal crashes in five months involving that type of plane, Argentina's state-run news agency Telam reported on Tuesday. The head of a U.S. Senate panel that oversees aviation issues said on Tuesday that he plans to hold hearings on the fatal crashes of two Boeing 737 MAX 8 jets since October, and suggested it would be "prudent" to temporarily ground the planes. India is grounding U.S. planemaker Boeing Co's 737 MAX aircraft immediately, the ministry of civil aviation said late on Tuesday, following the fatal crash of a plane of the same type in Ethiopia on Sunday. The U.S. aviation regulator said on Tuesday it would not ground Boeing Co 737 MAX planes after a crash in Ethiopia that killed 157 people, bucking a trend of countries around the world that have suspended the aircraft's operations.